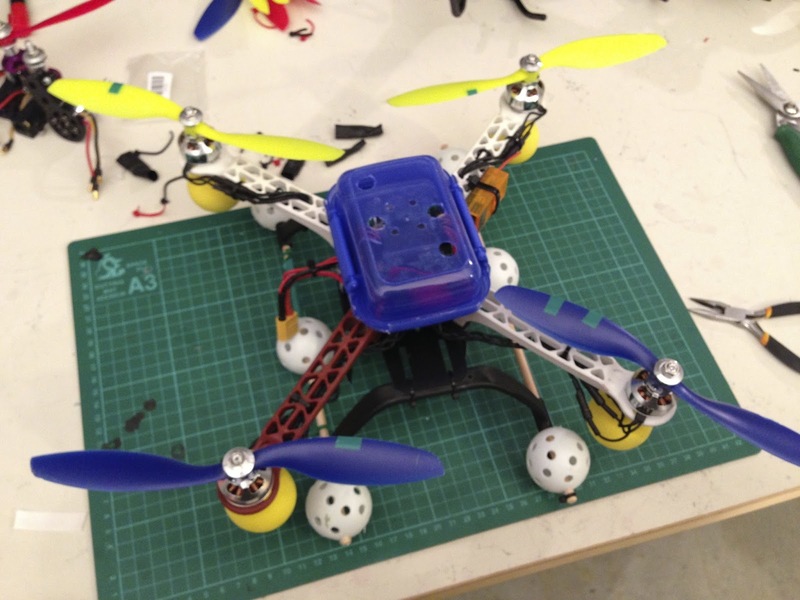 So after trying a quadcopter I decided to try a hexacopter. I ordered a frame from RCTimer so I could use the same arms from the quad. That way I ended up with alot of spares. 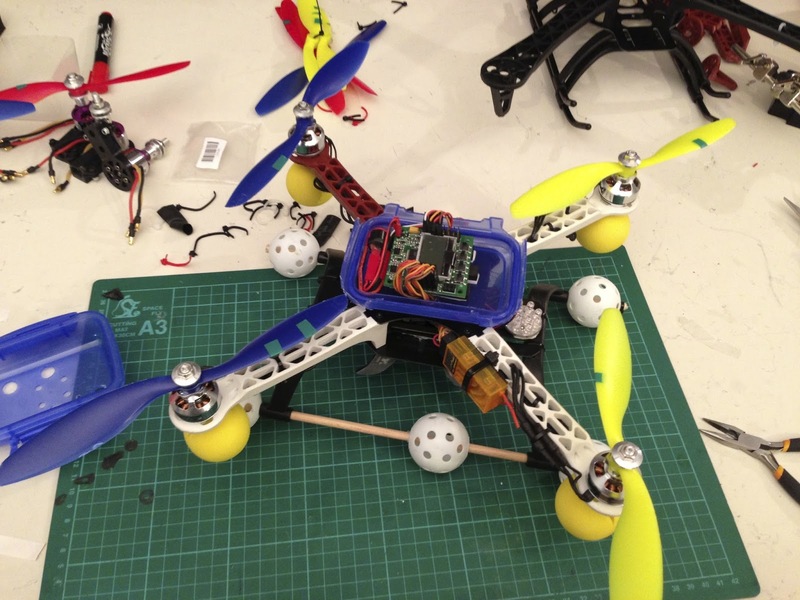 The hex is considerably larger than the quad and heavier. 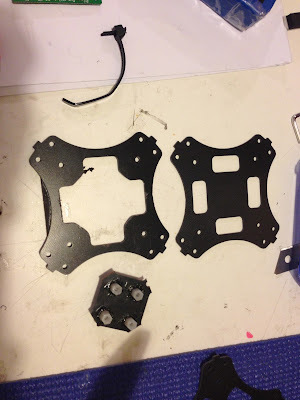 Below shows the center plates beside the quadcopter. Next I disassembled the quadcopter and started moving the parts over. Old arms and new arms connected up to the bottom plate. Wooden spacers on the bottom plate to hide the power harness and provide stable landing gear and somewhere to mount the camera. Landing gear attached with double sided tape. So after a couple of flights. I found due to the weight that the flight time as short 5-6minutes on a single 2200. compared to the quad which got 8-9min. Sure there was better stability, But I wasn't getting any better video form it than the quad. So until I can afford larger motors and batteries I will stick with the quad. .... But having said that If I was able to make a light version then that would be a different story. I plan to purchase a gimbal soon and that may push me back to the hex for video. After a long wait the little camera showed up. For under $100NZ this is a great alternitive to a GoPro at 6x the price. For a detailed review of the camera go here. Here is a quick video I did... the raw footage was clearer, but after going through iMovies and then up loading to youtude it lost some clarity. I need to figure out how to get bet upload quality. 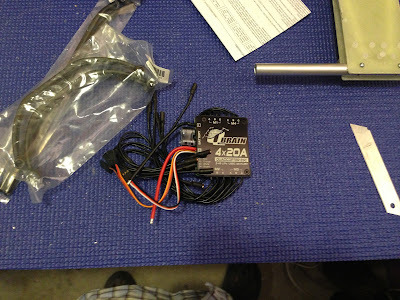 The little HK 330 running Turnigy SK3 1275kv motors had become my got to fun learn, practice quad. 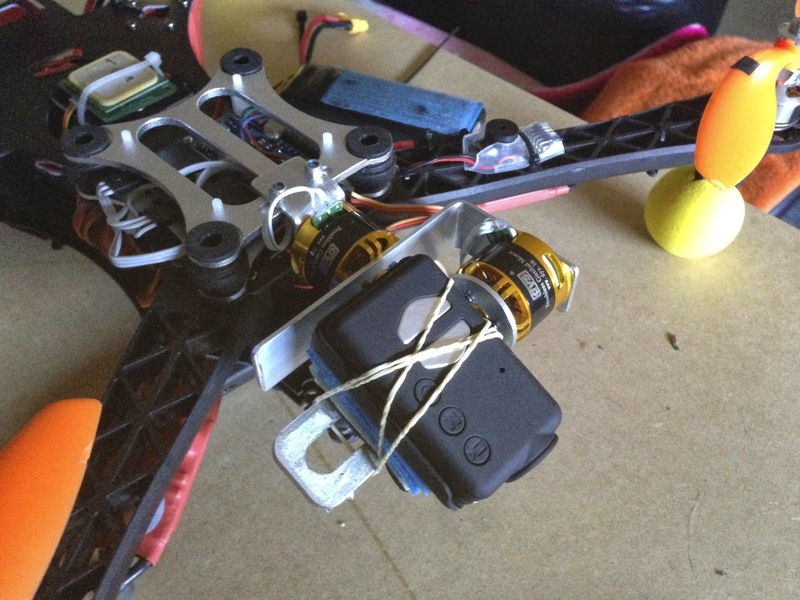 After I added some extra safety for hard landing I have not had another breakage. But I want to slim it down and see if I could make it littler and lower profile that it currently is. The first step to that was to try and eliminate the use of the click-clak platic box on top of the frame and relocate the KK2 board. But I still needed protection for the KK2. After some fiddling around I found that enough room to double-sided and velcro the KK2 to the top of the Q-Brain in the middle of the frame. However I still wanted to be able to programme and change settings if required. 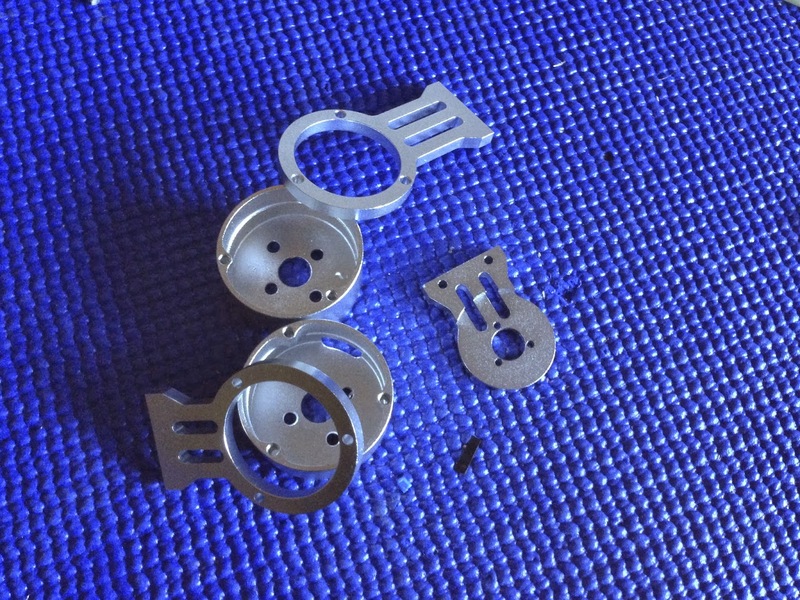 So I cut out the center part of the top plate, I don't think it will impact the strength a great deal, but we will find out in time and usage. 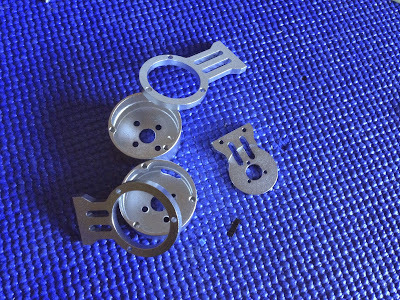 Center plate was cut with a hacksaw blade and the filed smooth. After the KK2 board was velcroed in and the top plate screwed back on I now have a very slime low profile Quad. 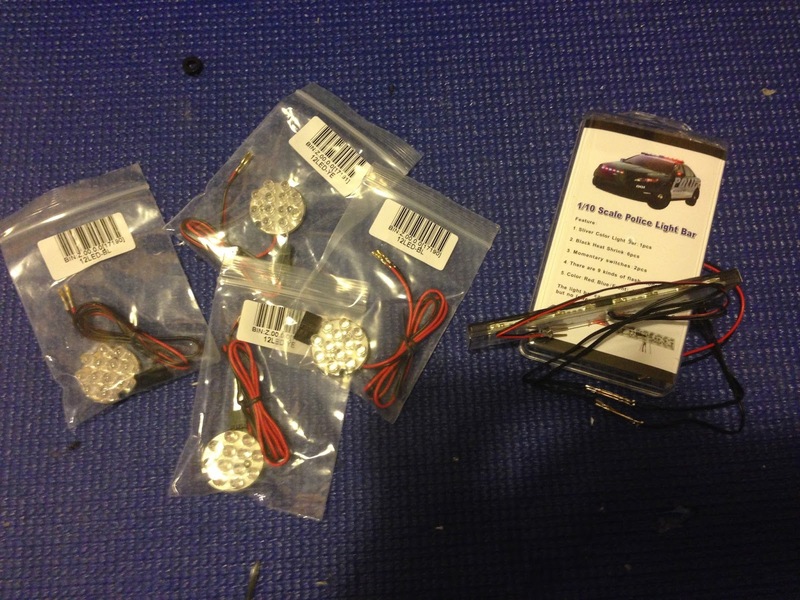 Next up is the lighting, as I have to some flying in the evening clam, ie after kids in bed I got the following addition lights from hobbyking. The police bar is very cool, you have different modes and you have blue / red on one side and yellow the other. 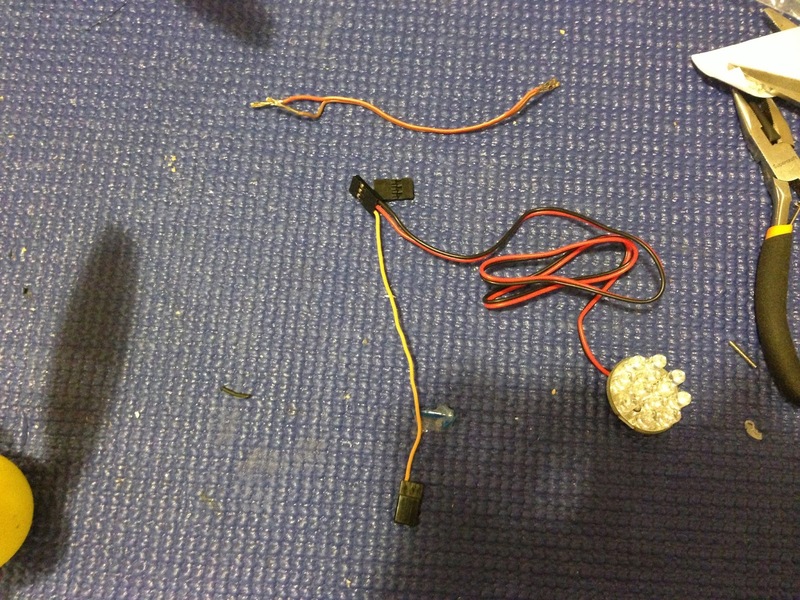 I wired it all up and make a power harness to use one of the receiver channels to power it. I also made this little harness to power the other additional light I will be adding. Since the receiver is only 6 channel I was running out of channels. So this has signal to got to the KK2 board for channel 5 (Arco / stabilised modes) and the positive / negative go the the 5v LED array. Over all the little KH330 Quad in how a much slimmer profile and lighter. 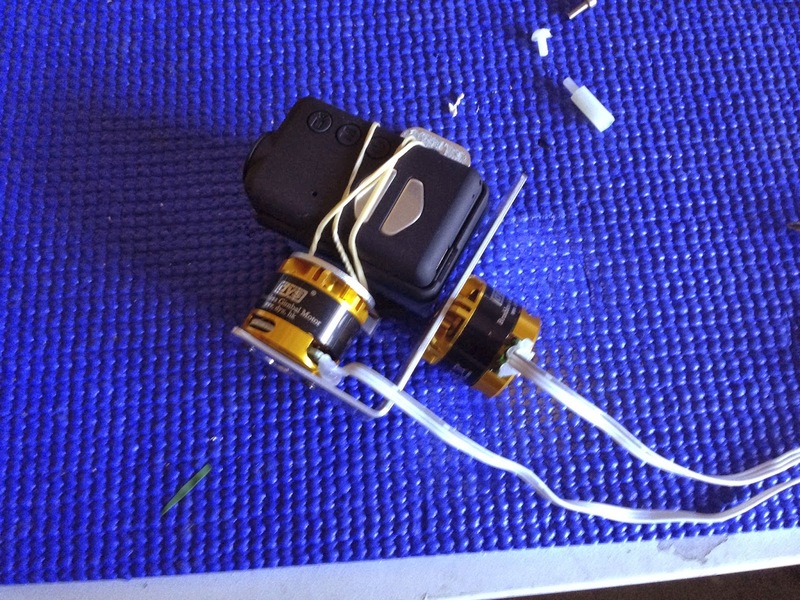 UPDATE : I re-added the heli legs minus the practice golf balls to provide protection to the battery. Well after a long wait I finally got the Batbone frame from Flitetest.com. 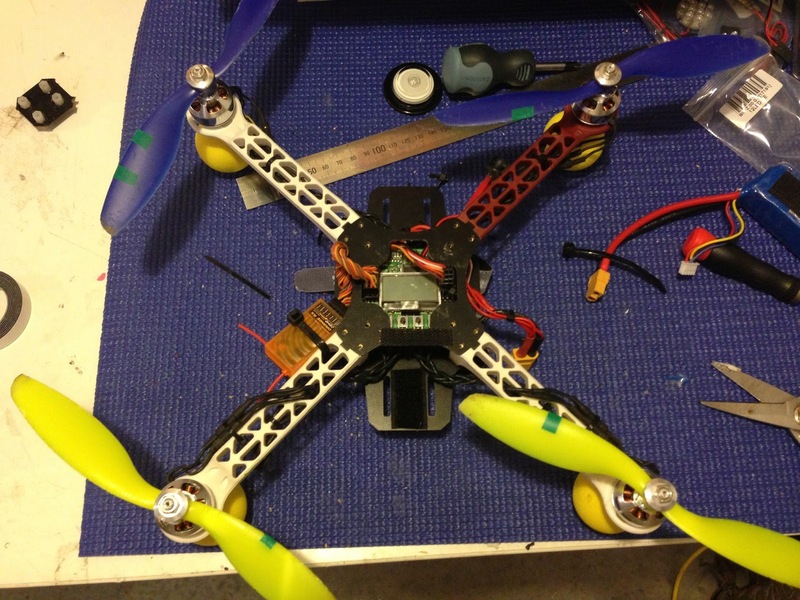 I have not included a build post here as I posted one over on the Flitetest site. There are a couple of alterations that have been made after the first builds. I have replaced the rear motors to be the same as the fronts, RcTimer 1000kv. I also increased the splay of the rear arms by changing out the nylon spacers with wooden ones as show below. One of the cool things on how I build the quad is the ability to change all angles easily. I also decreased the angle of the motors from 40 degrees to 30 degrees. This better suited my flying capability and the yaw speed is more than enough. It has been a long while since an update. But there has been a lot of flying and updates. The first update is that I have abandoned making my own V-Tail. 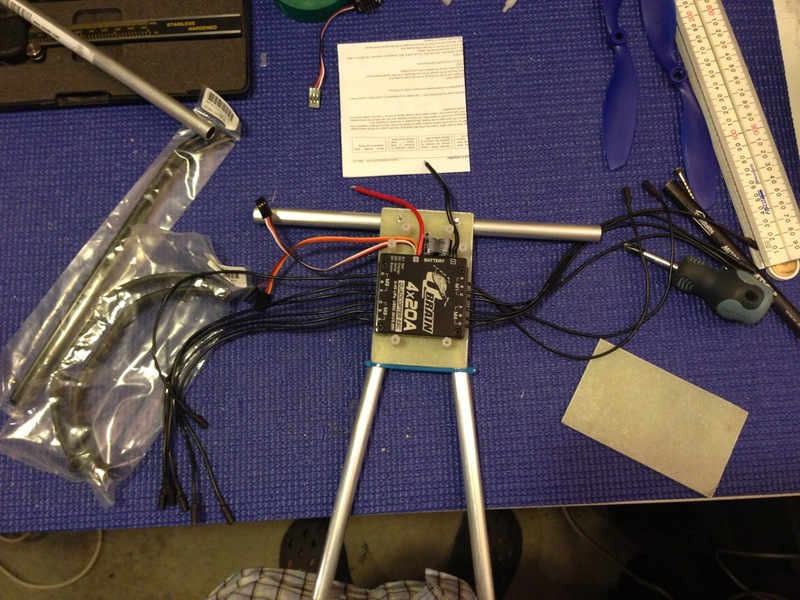 This is due to the Flitetest crew releasing their BatBone frame (Frame) and David.W making a Vtail. I love the design so will be getting one of those as the main frame for my VTail. I will use alloy tubes and the motor mounts that I have got. So look for a build blog of that once I get all the parts. The other exciting thing is that the APM 2.5 Flight controller and GPS unit from HobbyKing arrived. Unfortunately this was right before I had to leave for 16 days on a business trip. My main goto quad at the moment is the 330 frame with a KK2 board, after my initial crashes and breaks I have not had break since and it flies really well. The only upgrade is to have the KK2 and receiver mounted inside a container, to protect from crashes. I also added some extra crash absorbers on the frame corners (Foam balls) and extra on the landing gear. Since I have done this I have not broken anything while pushing my flying envelope. I can fly ok 90 degrees either side of centre but still struggling with nose in. I only fly this in full acro and its great for learning and practicing on. I also received from a kind old friend one very old GoPro, I got this the day before I headed away, I quickly zip tied it to the 330 and took it for a flight. Some of the jello filled video is below. The other exciting addition is that of the APM 2.5 with GPS, I also got a case for it. I mounted this in the 450 frame for extra stability. After a few hours of getting it setup I was able to get up an flying. Here are the links I found most helpful in getting up and running. There is a wealth of information out there, just start searching. After a couple of test flights I strapped the GoPro to the 450 frame and took it for a flight to capture some video. 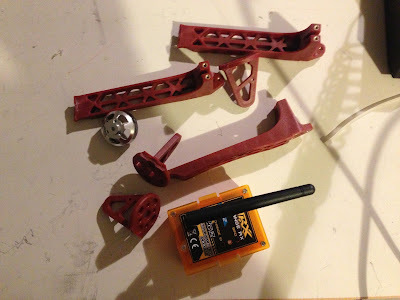 There is alot of jello, the frame has RCtimer 1000kv motors and 10x4.5 props all of which needed proper balancing. But I was just fun to capture some footage. It was a cold windy day so the quad was buffered around quite a bit. The QBrain ESC showed up a couple of days ago so I went ahead and started to figure out the mounting for the VTail quadcopter. The QBrain is not a square and is a little larger than the kk2 board so it makes it a little tricky to fit. After numerous tries, both with a single plate, with the QBrain on the same layer as the booms and on a separate layer. I finally decided on having it on a separate lay for this build. It gives me more room to play with, however on the next build... (yes there will be another build taking all my learning from this one) I will aim to reduce the build by one layer. The Qbrain in its new home. you can see its a tight fit around the nylon spacers. Additional holes cut on to the plates to mount the bottom plate that will hold the landing gear and QBrain. Heli landing gear holes made and bottom plate zip-tied to the landing gear. Hard to see, but the bottom plate screwed together with nylon standoffs and nylon screws. 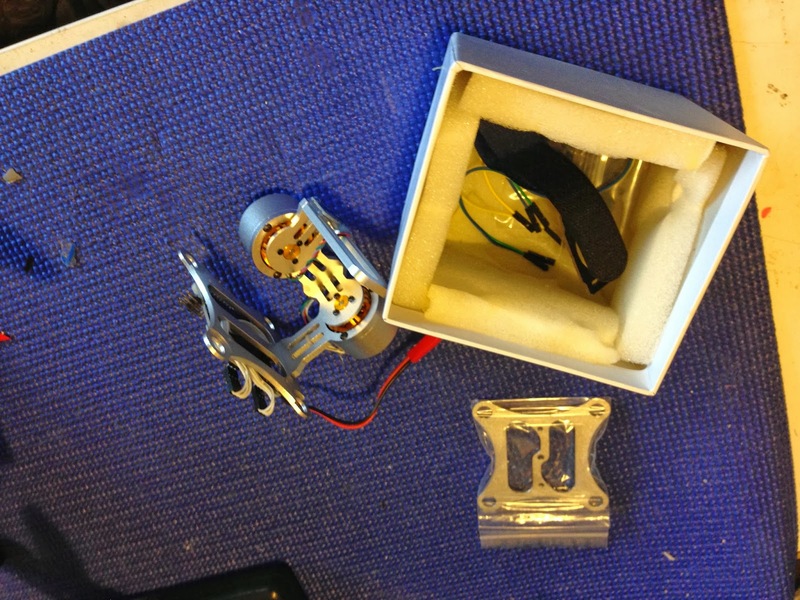 You can also see the QBrain double-sided taped to the base plate. The double sided tape I used is automotive trim tape. The frame complete, now waiting on motor mounts and motors. After crashing the 330mm quadcopter I finally went out and got some foam balls and practice golf balls to provide some extra protection from crashes. I just cut a slot in the foam balls and pushed them onto the feet on the bottom of the arms. 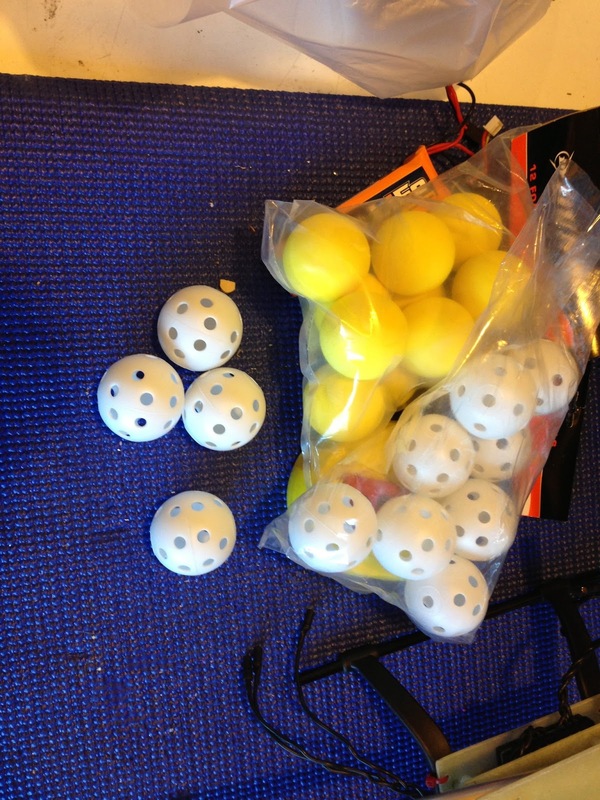 I then used some 6mm wooden dowel and hot glued the practice balls on to give extra landing protection. This also allows easier skimming on the ground when Im practicing flying in different orientations. So in my previous post I stated I was pretty happy with the HK 330 Frames. Will I am still but not as much as I was. They just break to bloody easily ...!! Then things started to go weird. I noticed that the transmitter and receiver sometimes took a little bit of fiddling to bind, I just though it was the power cycle on the receiver as I changed batteries. I didn't think much of it. But that was the most annoying part of the weekend. The crash appears to be due to the fact that the Orange DRX DSM module has malfunctioned. 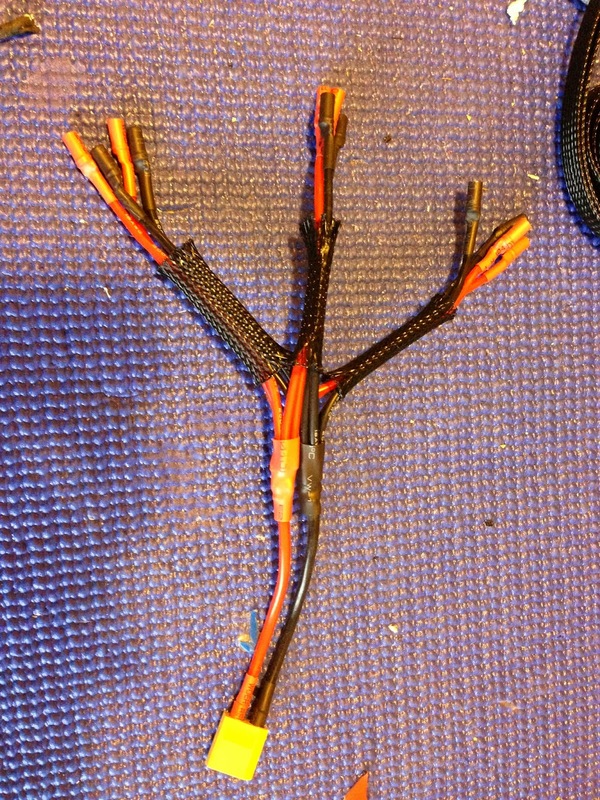 I am not able to get it to bind to any of the three orange receivers I have. 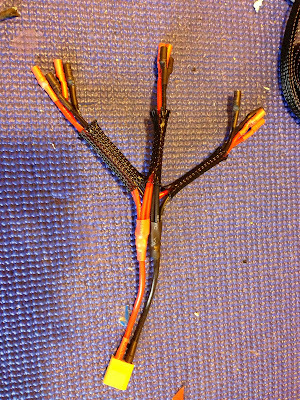 It powers on and I can put it into bind mode ... but cant bind to any receivers Even a brand new one, to eliminate the possiabity of damage due to the crash. So not sure whats gone wrong with it ... I have checked the forums and have not found much information any fixes. But on the HK website in the discussion area there are many reports of DOA units, but not of it working for a couple of weeks then failing. But after ready the threads Im very reluctant to order another one. So I had to revert back to the 9XV8 module and receiver. Thats when i found out I had also stuffed a motor in the crash. Overall the weekend was expensive ..... 3 x 330 arms, a motor and a OrangeDSM module. I was lucky to have the spare parts to enable me to patch / repair and get back flying. After looking at my options I decided to get a Orange TX as I have 4 receivers and dont trust the module. This will give me two transmitters. 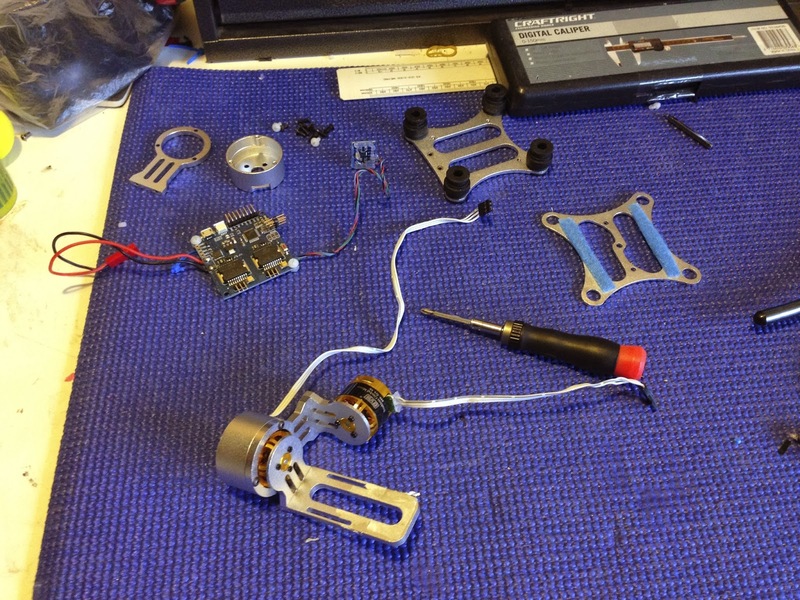 I can use the OrangeTX for the parkfly stuff and I can build out the TX9 with a FrSky module for long range stuff when I get to that level of experience.